After installing Ubuntu via a USB and restarting the computer it only boots windows. I checked on the BIOS and Ubuntu doesn't appear. I can boot into Ubuntu using the USB: it boots the menu: try Ubuntu, install Ubuntu, etc. then I press Esc and it shows the GRUB terminal, then I enter exit and the boot management appears. There, I can select Ubuntu which actually appears as a booting option (It doesn't in BIOS) and it runs the GRUB where I can select either Ubuntu or Windows. => No known boot loader is installed in the MBR of /dev/sdb. boot flag is set to the second fat32 partition. 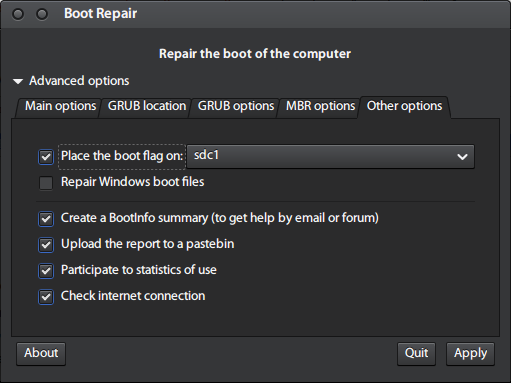 using Boot-Repair advanced menu, place the boot flag to /dev/sda (i.e. grub and boot flag should be set on the same partition). Not the answer you're looking for? Browse other questions tagged dual-boot grub2 16.04 boot-repair windows-10 or ask your own question. How to boot to grub by default?